In the first six months of life, infants are particularly prone to gastrointestinal (GI) signs and symptoms that have no obvious structural or biomechanical cause. The immature GI tract and its associated nervous system and microbiota are not yet functioning at optimal level. This can cause a range of disorders that are not classified as organic disease, but which can nevertheless be extremely distressing for both the infant and the concerned parents. The collective term for these conditions is functional GI disorders. Around 50% of infants will suffer at least one functional GI disorders before six months of age²`³. The most common one is reflux (which affects around 30% of infants), followed by colic (around 20% of infants) and constipation (around 15%)². It is common for two or more functional GI disorders to coexist in the same infant³. While individual estimates of prevalence vary due to different study designs (see Figure 1), it is clear that, together, the functional GI disorders affect a significant section of the population during the most vulnerable years. The signs and symptoms of functional GI disorders are distressing for child and parent alike. This can lead to considerable social consequences, as parents struggle to cope with their unhappy infant. Research shows that children who experienced functional GI disorders as infants are more likely to suffer from abdominal pain throughout childhood⁵⁻⁸, have sleeping or behavioural problems⁷⁻¹¹, and be perceived as fragile by their mothers¹². Parents of children with functional GI disorders are more likely to have a poor quality of life⁹`¹³ and suffer from tiredness, fatigue or postnatal depression¹⁴`¹⁵. They are also more likely to give up breastfeeding at an earlier stage¹⁶ or make multiple changes to their child’s formula¹⁷. As parents desperately seek some comfort for their distressed child, the costs inevitably mount up. Home remedies, over-the-counter remedies, medical consultations, prescribed treatments and lost income due to time taken off work all contribute to a total economic impact that has been estimated at £72.3 million per year in England¹⁸. This “conservative estimate” (outpatient costs were excluded, for example) includes around £50 million of costs to the NHS. Parents also spent £13.6 million on over-the-counter colic medicines with no evidence of efficacy¹⁸. Earlier studies estimated that the NHS spends around £65m each year to help parents manage infant crying and sleeping problems in the first 12 weeks of life¹⁹. In the US the total national cost for emergency department visits due to constipation alone has been estimated at $1.6bn²⁰. Infants account for the highest proportion of these visits. In the following infographic we take a look at how more effective reassurance, advice on nutrition and practical approaches, rather than medication, could be key to reducing the financial burden of functional GI disorders. Infant functional GI disorders is an umbrella term for the signs and symptoms of seven GI disorders, affecting young children. The most common functional GI disorders are infant reflux, infantile colic and functional constipation. Around 50% of infants will suffer at least one functional GI disorder or related sign or symptom before six months of age. Functional GI disorders have no obvious organic cause, but are thought to be due to changes in the infant’s GI system as it matures. Functional GI disorders are highly prevalent during the early months, cause significant distress and impose a considerable burden on the finances of concerned parents and overstretched healthcare systems. Managing infant functional GI disorders is estimated to cost at least £72.3m per year. Diagnostic criteria for the seven functional GI disorders have been internationally agreed. Functional GI disorders are best managed through a combination of parental guidance and nutritional advice. Nutritional advice should stress the benefits of continuing breastfeeding. In non-breastfed infants with common functional GI disorders, specialist formulas may be considered. Pharmacological management may be of use in functional constipation but is rarely appropriate in other common functional GI disorders. Patient-centred guidance and reassurance is likely to be more effective than the traditional “doctor-knows-best” approach. The information above is designed to help healthcare professionals support parents, but if you still need assistance, at Nutricia Early Life Nutrition we have two carelines with two dedicated phone numbers; one for your patients to call directly, and the other specifically for healthcare professionals. The Nutricia Early Life Nutrition healthcare professional helpline is staffed by people who understand what it’s like to be on the frontline of healthcare. Our team has over a hundred and fifty years’ cumulative experience, including hands-on experience in midwifery, as well as paediatric and neonatal nursing. In the following guide and infographic designed for healthcare professionals we take a detailed look at the impact of infant functional gastrointestinal (GI) disorders. 1. Benninga MA, Faure C, Hyman PE, St James Roberts I, Schechter NL, Nurko S. Childhood Functional Gastrointestinal Disorders: Neonate/Toddler. Gastroenterology 2016;150:1443–1455.e2. 2. Vandenplas Y, Abkari A, Bellaiche M, Benninga M, Chouraqui JP, Çokura F, et al. Prevalence and Health Outcomes of Functional Gastrointestinal Symptoms in Infants From Birth to 12 Months of Age. J Pediatr Gastroenterol Nutr 2015;61(5):531–7. 3. Iacono G, Merolla R, D’Amico D, Bonci E, Cavataio F, Di Prima L, et al. Gastrointestinal symptoms in infancy: a population-based prospective study. Dig Liver Dis 2005;37(6):432–8. 4. Gut Feelings Survey of 600 parents of children under 2, who experienced FGIDs as infants and 110 HCPs (40 GPs, 40 HVs, 30 Community Pharmacists) across the UK. Conducted in December 2017. Data on file. 5. Partty A, Kalliomaki M, Salminen S, Isolauri E. Infant distress and development of functional gastrointestinal disorders in childhood: is there a connection? JAMA Pediatr 2013;167(10):977–8. 6. Indrio F, Di Mauro A, Riezzo G, Cavallo L, Francavilla R. Infantile colic, regurgitation, and constipation: an early traumatic insult in the development of functional gastrointestinal disorders in children? Eur J Pediatr 2015;174(6):841–2. 7. Canivet C, Jakobsson I, Hagander B. Infantile colic. Follow-up at four years of age: still more ‘emotional’. Acta Paediatr 2000;89(1):13–7. 8. Savino F, Castagno E, Bretto R, Brondello C, Palumeri E, Oggero R. A prospective 10-year study on children who had severe infantile colic. Acta Paediatr 2005;94(449):129–32. 9. Rautava P, Lehtonen L, Helenius H, Sillanpää M. Infantile colic: child and family three years later. Pediatrics 1995;96(1 Pt 1):43–7. 10. Neu J. Gastrointestinal maturation and implications for infant feeding. Early Hum Dev 2007;83(12):767–75. 11. Santos IS, Matijasevich A, Capilheira MF, Anselmi L, Barros FC. Excessive crying at 3 months of age and behavioural problems at 4 years age: a prospective cohort study. J Epidemiol Community Health 2015;69(7):654–9. 12. Forsyth BW, Canny PF. Perceptions of vulnerability 3 1/2 years after problems of feeding and crying behavior in early infancy. Pediatrics 1991;88(4):757–63. 13. Brown M, Heine RG, Jordan B. Health and well-being in school-age children following persistent crying in infancy. J Paediatr Child Health 2009;45(5):254–62. 14. Kurth E, Kennedy HP, Spichiger E, Hösli I, Stutz EZ. Crying babies, tired mothers: what do we know? A systematic review. Midwifery 2011;27(2):187–94. 15. Vik T, Grote V, Escribano J, Socha J, Verduci E, Fritsch M, et al. 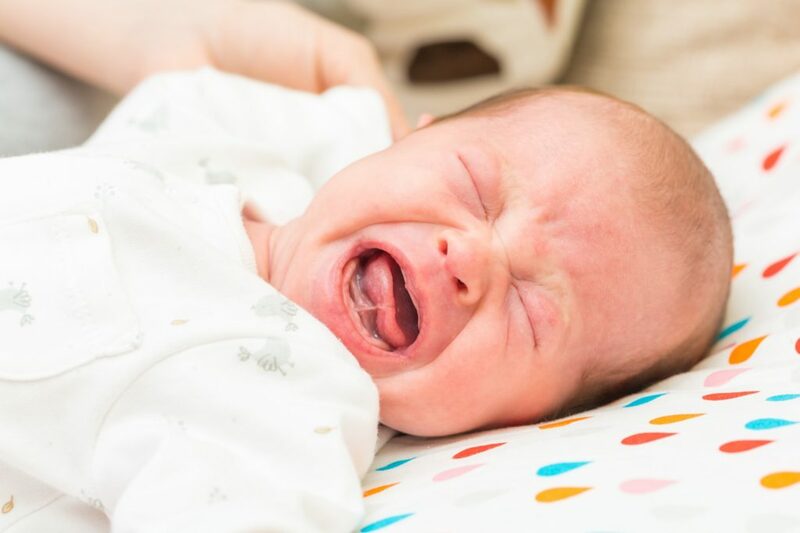 Infantile colic, prolonged crying and maternal postnatal depression. Acta Paediatr 2009; 98(8):1344–8. 16. Howard CR, Lanphear N, Lanphear BP, Eberly S, Lawrence RA. Parental responses to infant crying and colic: the effect on breastfeeding duration. Breastfeed Med 2006;1(3):146–55. 17. Nevo N, Rubin L, Tamir A, Levine A, Shaoul R. Infant feeding patterns in the first 6 months: an assessment in full-term infants. J Pediatr Gastroenterol Nutr 2007;45(2):234–9. 18. Mahon J, Lifschitz C, Ludwig T, Thapar N, Glanville J, Miqdady M, et al. The costs of functional gastrointestinal disorders and related signs and symptoms in infants: a systematic literature review and cost calculation for England. BMJ Open 2017;7(11):e015594. 19. Morris S, James-Roberts IS, Sleep J, Gillham P. Economic evaluation of strategies for managing crying and sleeping problems. Arch Dis Child 2001;84(1):15–9. 20. Savino F. Focus on infantile colic. Acta Paediatr 2007;96(9):1259–64.